eContent Pro International proofreading provides fast, high-quality, affordable proofreading that will optimize the accuracy and readability of your document, ultimately ensuring that its contents are communicated in the clearest way possible to your readers. "I am editing a book with IGI Global. I recommend you to Japanese chapter paper authors. I am glad that you could re-edit our revised paper after the referees' review processes." "Quality language editing services at an affordable price! Simply the best!!!" 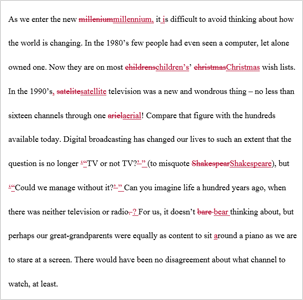 "I was very impressed with eContent Pro's Copy Editing Service. Markups were clear and consistent across the document: our editor did a great job correcting style manual issues, as well as syntax issues, without disrupting our intent." "Recently, I utilized eContent Pro Copy Editing to complete a copy editing job. Editing was very thorough and they completed my article in three days." "First time using a copy editor. Thank you for the positive experience." "Good editing and a timely delivery. It allowed me to take into account aspects of the journal that I had not considered, and that will be very important in the review." "I was impressed that it was done timely, and wherever the content was not clear for the reader, the paper was improved with better readability for the audience." "Quality of work is very high, and communication is very attentive and respectful. If somebody asks me where it is possible to do professional copy editing, I'll willingly recommend your services." "Quick service and a wonderful editing experience." "I used some other proofreading services on many other occasions, but in the future, I will use yours, because I was really satisfied." "I was especially impressed by your quick and adequate response, as well as the very easy way to ensure payment." "I am impressed working with eContent Pro International. Copy editing was done professionally and quickly. I will recommend the service to my colleagues." "You made very qualified work. It was a pleasure working with you. Next time I will definitely use your services." "My eContent Pro editor was invaluable both for correcting my citations and instructing me on the format for references. Also, I appreciated how quickly my job was completed." "Excellent job. I recommend researchers to experience eContent Pro’s high-quality services." "The copy editing services provided by eContent Pro are fast, efficient, and of high quality. I can recommend them to any person or organization requiring quick turnaround and accuracy." "Fast, efficient and of high quality. I’m impressed and happy with this service." "The service was quick and very precise. I was very surprised when I got the corrections in less than a week in my mailbox." "The service was very fast, very thorough, and very helpful in ensuring our chapter meets the criteria and requirements of the book's editors. I was quite impressed and happy with your service." "The eContent Pro service was fast, accurate, and thorough. Their feedback helped to improve the quality of our manuscript. I would use them again for future writing projects." "Working with eContent Pro is easy and straightforward. I was quickly given cost and time estimates for my job and my edited manuscript was completed when promised… I was pleased with the result." "Your work was excellent and helped us to have the article published." "My experience with eContent Pro was pleasant and effective. I was given a warm welcoming and a sense of appreciation." "eContent Pro provided strong service with a quick turn-around. I was pleased with the quality of their work." "eContent Pro’s staff was responsive on the phone and email, and quickly responded to all questions and concerns." "The work undertaken was of a very high standard, excellent turn around time and we have a far better document as a result." "eContent Pro is excellent for copy editing. Thank you for your attention." "The turnaround time was amazing and much appreciated. And I have another manuscript that will need editing in the future and I will check here first for editing." "I found the work actually spectacular. The editing, formatting, and other checks were very thorough. The turnaround time was great as well. I will definitely use eContent Pro in the future." "I've felt so comfortable while and after contacting eContent Pro. They are fast in responding, and I received a high quality of editing for my manuscript in unexpected time. Thanks a lot for the great eContent Pro team." "I’m happy because the reviewer has some knowledge on the subject of the text, and that undoubtedly facilitated the accuracy of his review." "I am happy with the work and will be pleased to recommend eContent Pro to others. I am also planning to use your services for my other research articles which are under process." "I am very pleased with the editing procedure both in terms of quality and time. I would recommend eContent Pro services because of the professionalism and the quality of work!" Completion Time: On average, proofreading for a manuscript takes 6 business days under our standard proofreading service. If your document exceeds 30,000 words, an eContent Pro International representative will contact you regarding an adjusted completion time frame. If your project exceeds 30,000 words, contact us for cost and delivery options. Our professional proofreaders will check your document with line-by-line precision for grammar, spelling, punctuation, and word usage. With over 70 years of combined editorial experience and an established track record of satisfied customers, our expert editors are the some of the best in the business and will provide the highest level of precision and care for your document. Meet our team to learn more about their experience and expertise. eContent Pro International is committed to providing the highest quality of proofreading for your document. We are a proud member of the Society for Editors and Proofreaders, which we use as a benchmark for our proofreading standards. We accept Microsoft Word documents to allow use of the Track Changes feature, allowing you to review and accept all changes we make to your document. Do you make changes online or through a hard copy? Changes are made in the Word document using Microsoft Word’s Track Changes feature, allowing you to review and accept all changes we make to your document. If there is an editor you feel would be best suited for your document, you may mention their name in the "Comments" field of the submission process. We will always strive to match your document with the editor who is best suited for its contents. What qualifications do your editors have? Our editors have over 70 years of combined editorial experience and hold a wide range of degrees. Learn more about them on our Editors page. Do you offer samples of your work? Yes, you can find samples of our work on our Samples page. How quickly will you edit my document? Most documents will take a maximum of 6 business days to complete. Please feel free to contact us if you would like more information for the completion time of a specific document. Do you provide documentation certifying that my document has been professionally proofread? Yes. Documentation for proof of proofreading is available upon request. We edit virtually every type of document, including research papers, journal articles, books (drafts, fiction, non-fiction, and reference books included), book chapters, essays, proposals, dissertations, and theses. When proofreading is finished, you will receive an email notification containing a link to download your final, proofread document. The document will be a Microsoft Word file with Track Changes enabled, allowing you to review and accept all changes we make to your document. With a state-of-the-art Enterprise Account partnership, your business can easily integrate eContent Pro International's proofreading service into your company's strategies to increase your organizational effectiveness. Contact us to learn more about eContent Pro International and allow us to open an enterprise account for you.